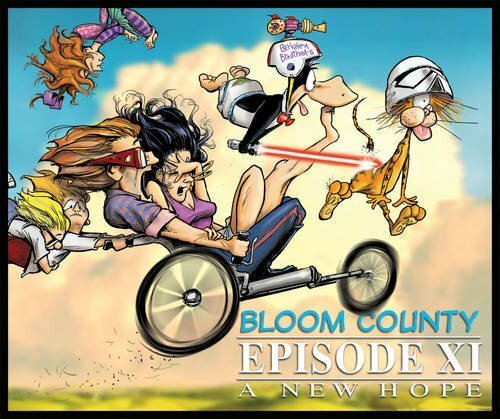 I haven't been following the return of Bloom County super closely, but I do enjoy the strips when I encounter them on Facebook or Twitter. I was stoked to see this volume listed on NetGalley, though, and snapped it up. At 73 pages long, it was a surprisingly slow ebook read. Probably that page count should be doubled, since it encompasses four strips/page, which even people with great vision probably need to read two to a screen. Reading graphic materials on an ereader is still a drag, so some of my meh feelings about Episode XI could be attributed to the annoyance of having to enlarge each page (and still squint sometimes). I guess I didn't notice back in the day that women were mostly adjunct characters, and that there weren't any? many? prominent characters of color. I caught it this time, though there is a little yoga girl, whose placement on the cover is a good indicator of her role as a principle, but separate player. At least Binkley is self-reflective about his white dudeness, kind of. The two spaces after a period campaign platform is funny to me, because I am passionate about my total disagreement with Opus & Bill the Cat's preference for two spaces. I'm not crazy about Opus's assessment that "some bad, over-heated 'li'l friskies'" and Megyn Kelly are the same thing because feminist killjoy, and I find the Bloom County fan notes at the bottom of numerous pages to be annoyingly self-congratulatory, even narcissistic. Is that somehow the point? If so, I'm missing it, again, feminist killjoy.